check back daily for a location near you! "The product I received was all in excellent condition. I've always had a great experience with JCPenney. Condition is as expected and the shipping process has been good- no complaints!" "Really happy with the load and the manifest was accurate. Clothing is in good shape, we do well with the apparel. We also do great with their drapes!" 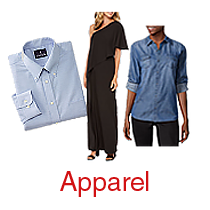 "JCPenney has been great to purchase from. The condition of the merchandise I received was as expected and the shipping process was easy. 5 stars!"